B & B With your Horse! Whether you’re just stopping on your way through and need a comfy bed for you and a safe place for your horse, or you’re looking for a new place to explore from the back of your own horse for the weekend, our Bed & Bales is perfect. Based on our Cabin Rental option, Bed and Bales offers you the chance to bring your horse along for some fun while enjoying the amenities of Aspengrove Country Resort. Spend the night in one of our charming cedar cabins and then spend the day exploring from the back of your equine friend. Our sand arenas and horse facilities are open for you to use as well during your stay. Please visit our Horse Facilities page for more information on what we offer. Your equine buddy will be happy in one of our extra-large paddocks with run-in shed, automatic waterers and wood rail fencing. We’ll supply the hay and you supply any additional feed or supplements. 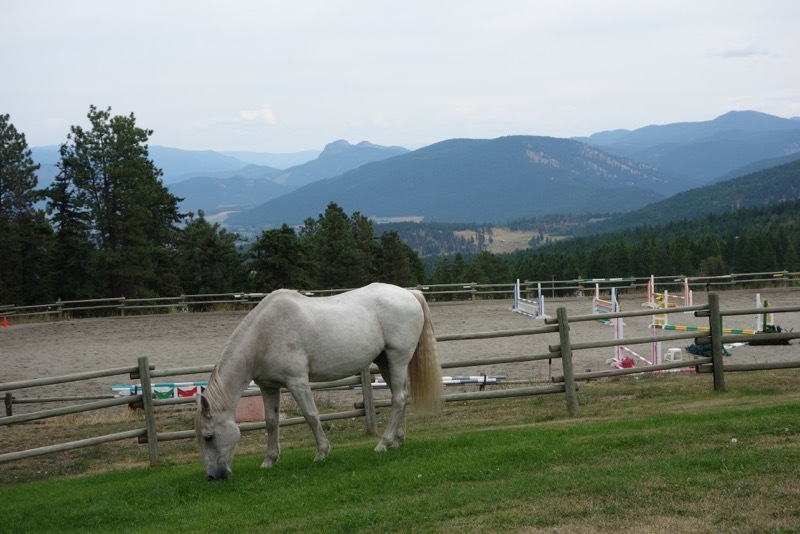 Please visit the Resort Information page or our Horse Facilities page for more information on our amenities. 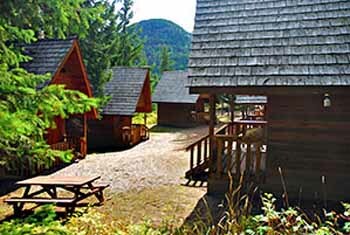 Our cedar chalet cabins all have electricity and are heated. Basic Cabins have bunk beds and can accommodate 4 guests. Our Deluxe Cabins for two guests have queen beds. Washrooms & hot showers are a 10 second walk away in our Cookhouse where you’ll also find a lounge area with satellite TV/DVD for movies and the kitchen and dining area. Bed and Bales guests are welcome to use our fully equipped kitchen to prepare meals and snacks. 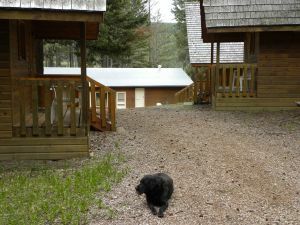 Our Basic Cabins 2-5 have two sets of bunk beds and will sleep up to 4 people. Cabin 7 has 3 bunk beds so will sleep 6. We supply all the bedding and towels. If you bring your own bedding and towels there can be an up to $10 rebate per cabin (depending on the number of beds used). The 2 deluxe cabins have a queen size bed. All linens and towels are included. There is a two person limit in these cabins. Your horse will be treated to an extra-large paddock with roomy run-in shed, wood-rail fencing and automatic waterers. Our excellent grass-mix hay is included. You are free to use our sand arenas and other facilities during your stay. We have about 5 k of trails on the property. Access to miles of crown land is minutes away and we can point you in the direction of popular trails to explore.